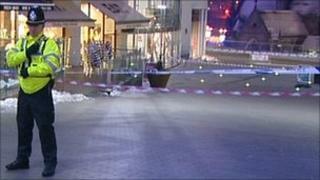 A man arrested after a shooting outside Birmingham's Bullring shopping centre has been released on bail. A 19-year-old man was found with a gunshot injury to his leg after police were called to reports of an incident involving a gun on Sunday afternoon. A 26-year-old man has been released on bail pending further inquiries. Police said there was a disturbance inside the centre before the shooting, which happened outside. Managers said it was "business as usual" on Monday. They said a cordon inside the shopping centre was lifted shortly after it shut at its usual Sunday closing time of 1700 GMT and a cordon outside was lifted at about 2300 GMT. About 170,000 people went into the centre on Sunday. General manager Tim Walley added: "Fortunately the vast majority of customers were oblivious to what had happened. "It didn't really have an impact on trading on Sunday." The 19-year-old man has been released from hospital. West Midlands Police said the 26-year-old man received hospital treatment for facial injuries after the incident.